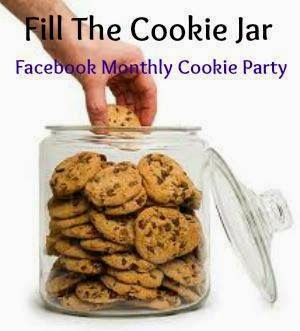 Today is the July edition of Fill the Cookie Jar! This month our theme is a Patriotic Cookie. I just have to give a big thanks to Cynthia for organizing this group and keeping us challenged. I really like the push to try a new cookie and break out of my routine! For the Patriotic Cookie, I decided on these Independence Day Jello Sugar Cookies. They are so fun and a great cookie! Definitely a bit of a sugar rush with each cookie, so be sure if you make these to share with your friends! I frosted with a cream cheese frosting to cut the sugar level down a bit. Really? Are you believing that? I will try any excuse to have Cream Cheese Frosting in the house! Having such a fruit flavor in a cookie is a bit strange for me, and not something I would make regularly. But, definitely fun and tasty, for a treat! These would be fun with orange for Halloween, or lime for St. Patricks Day. Of course, cherry and lime for Christmas. Even fun for a tailgating party with your teams colors! Preheat oven to 400 degrees. In a large bowl, cream butter and sugar. Add the eggs and vanilla, mixing until completely combined. In a medium bowl combine flour, baking soda, and salt. Add dry ingredients to butter mixture, mixing until flour is completely combined. Divide dough in half. Add 3 tablespoons of Cherry Jello to one half of dough, and 1/4 to 1/2 teaspoon of red food coloring. Mix until color is completely combined and no streaks remain. Next, add 3 Tablespoon of Berry Blue Jello, and about 1/4 teaspoon of blue food coloring to the other half of dough. Mix until color is completely combined. Set aside two small bowls, and add one tablespoon red jello mixed with one tablespoon sugar to a small bowl. And do the same with the blue jello, adding to another bowl with one tablespoon sugar. Roll one tablespoon of cookie dough into ball, then roll in the coordinating jello sugar mixture. Place on baking sheet several inches apart. Flatten each cookie slightly with the bottom of a glass. Bake for 9 to 10 minutes. Cool on baking sheet for 5 minutes, then transfer to cooling rack. I've seen jello cookies before but have never eaten them. I love how use used the colored sugar with white frosting, really added a little pop of color. These are gorgeous! Visiting from Feeding Big, wishing you a happy holiday weekend! I have never made a jello cookie before, but I know my family would love them! Great recipe! Thanks for sharing them at the #FillTheCookieJar Facebook group! These are so cute and so festive. My kids would love them!!! I love the red and blue with the cream cheese frosting, brilliant. This is a great recipe. My grandson would be on cloud 9 with these cookies. I'm going to save the recipe for Christmas holidays, it's a great recipe exchange cookie and my grandson will be thrilled too. These do sound really good! Have a great 4th! I've never thought of using Jello in cookies before, what a neat idea! Love the colours, so festive! Yay! You're back!!! These look very interesting - and festive. Well done my friend. I think my kids would absolutely love them!!! !